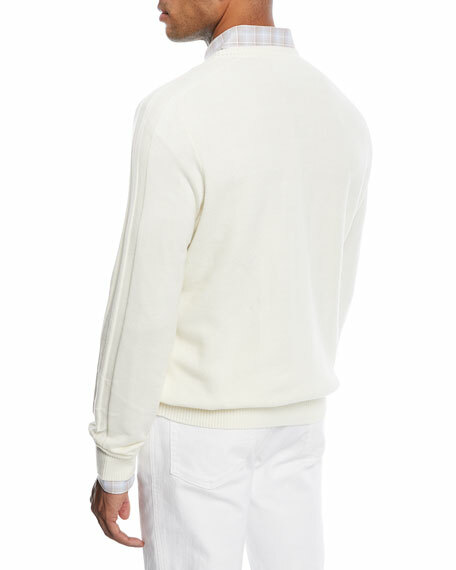 Brioni sweater in honeycomb knit. Derek Rose "Finley 1" m? ?lange sweater in luxurious 12 gauge pure Italian cashmere. Ribbed collar, cuffs, and hem. Crew neckline with triangle stitch. Fully fashioned arm holes. Long sleeves. Pullover style. Hip length. Classic fit. Cashmere. Dry clean. Imported. Model's measurements: Height 6'1"/185cm, waist 32"/81cm, typically wears size M.
Neiman Marcus cashmere-blend cardigan. V neckline; button front. Long sleeves. Patch pockets with zigzag topstitching. Classic fit. Cashmere/silk. Trim, leather. Neiman Marcus cashmere-blend cardigan. V neckline; button front. Long sleeves. Patch pockets with zigzag topstitching. Classic fit. Cashmere/silk. Trim, leather. Imported. EXCLUSIVELY AT NEIMAN MARCUS Neiman Marcus henley sweater in honeycomb knit. Ribbed collar, cuffs, and hem. Crew neckline; three-button front. EXCLUSIVELY AT NEIMAN MARCUS Neiman Marcus henley sweater in honeycomb knit. Ribbed collar, cuffs, and hem. Crew neckline; three-button front. Long sleeves. Pullover style. Cashmere/cotton. Imported. 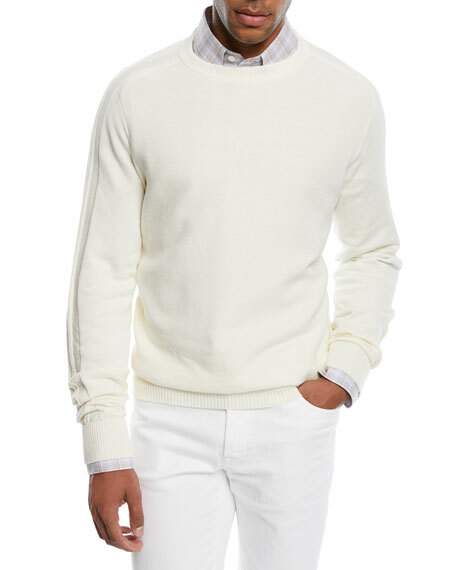 Model's measurements: Height 6'1"/185cm, waist 32"/81cm, typically wears size M.
EXCLUSIVELY AT NEIMAN MARCUS Neiman Marcus cashmere-blend sweater. Stand collar; half-zip front. Long sleeves. Pullover style. Cashmere. Imported. Model's measurements: Height 6'1"/185cm, waist 32"/81cm, typically wears size M.